With every stroke of his brush, James C. Christensen is fast becoming one of the world's most beloved artists. Best known for his whimsical paintings of "poofy guys" and floating fishes, flying boats and flying pigs, James captivates his audience with his fascinating realm of make-believe. And while most people are enchanted with his paintings at first glance, if they look a little closer, they can usually learn a few eternal principles as well. James's work is unique and eclectic. He has depicted Catholic saints and sinners in the style of the Renaissance masters, and he has painted events and parables from the scriptures. Of course, he is most famous for his fantasy paintings, and interestingly enough it is many times in his most imaginative creations that you can spot LDS themes - where humans are eternal beings, often striving to better themselves; where the Everyman struggles to shine his light in a dark world; and where characters show courage and faith in the midst of adversity. James's extraordinarily fresh point of view has won him numerous Chesley Awards from the Association of Science Fiction and Fantasy Artists, all sorts of professional art honors from the World Science Fiction Convention, and the Utah Governor's Medal for Fine Arts. Today James's works can be found in valuable collections throughout the world - but it all began with a simple pencil and sketch pad more than fifty years ago. According to James, his love for art has been with him since he was born. "If there's a part of you that comes prewired, my enjoyment of creating things on paper was always there," he says. "As a kid, a white drawing pad was just the promise of magic. It's full of possibilities." James spent much of his childhood by himself, and that's just how he liked it. "I'd pass up a Sunday drive for the chance to draw. I didn't mind being alone - my brain just had creative things going all the time." James grew accustomed to people commenting about his wild imagination, but he didn't understand what all the fuss was about. He recalls, "There was a point in my life when I looked around and said, 'Why doesn't everyone else have an imagination like mine?'" His interest in art grew in high school and solidified the path he would take in life. "By the time I got to college, I realized art was where my talent was and where my bliss was." After serving a mission in Uruguay, James married his wife, Carole, who grew up with him in the same ward in Culver City, California. They had five children, which presented some unique challenges for James - raising a family while trying to create art was not always easy. "When my children were growing up, my studio was adjacent to our family room," James recalls. "There was one rule while I was working: unless you are personally on fire, do not open that door." Despite his edict, the children occasionally crossed James's carefully drawn boundaries. Once, when James was working on an acrylic painting of Joseph F. Smith, he commented to his wife that he had spent several days meticulously detailing the long, white beard and still had a long way to go. His son, who was about four years old at the time, decided to step in and offer his assistance. "The next day I went down to the basement to paint, and I found a million little lines drawn with red permanent marker on the beard," James says with a laugh. Although he had to start the painting from scratch, he couldn't help but be touched by his son's desire to help. As it turns out, being raised around so much creativity rubbed off on the family: all three of James's daughters followed in his footsteps and are now accomplished artists in their own right. After James finished his master's degree at BYU, he wanted nothing more than to stay there and teach art - but things didn't turn out according to plan. Despite the unexpected detours in his career, or more precisely because of them, James says he came to recognize God's hand in his life. "I had a terrible portfolio, I didn't know what I was doing, and no one wanted me," he says. "But this school recruiter did. I was offered a job as a junior high art teacher in Santa Maria, California - a job I didn't want. Carole and I prayed about it, and the next morning I looked at her and said, 'I think we should do this.' She said, 'I do too.' It was not part of our plan, but it turned out that's where we matured spiritually and learned how to be strong, active members of the Church. I was in the bishopric before I was thirty, and Carole was also in many leadership positions." After about five years, James made the decision that he couldn't teach any longer, although he found it to be very fulfilling. "I needed to pursue my dream," he says. "I wanted to be an artist." The principal gave James a leave of absence, but he never went back. He freelanced for a while and was eventually hired to work at the New Era as a designer and illustrator. "My dream through all of this was to teach at BYU. I prayed about it for eight years, and I kept getting ignored, I thought," he says. "I kept putting my portfolio into BYU. I kept getting turned down. So I took the job at the Church magazines." He continues, "I got to the point where I didn’t pray about teaching at BYU anymore. I decided Heavenly Father already knew what I wanted." Three months later, James was invited to interview for a job to teach design and illustration at BYU - both valuable skills he had gained while working for the Church magazines. "It turned out that God was listening," James says. "He prepared a way for me to get in, just not the way I thought. I got a confirmation that God was taking care of me, but it was on his time." James taught art at BYU for twenty-one years. He retired eleven years ago. In addition to fulfilling his dream of teaching at BYU, James says one of the "nice pieces of frosting" in his life happened in 2002 when he was invited to join five other artists to paint the Nauvoo temple murals. "When I was thirteen years old, I went to the open house for the Los Angeles temple. There were huge, beautiful murals. I remember thinking that an artist could never aspire to anything greater than to paint murals in the temple. At the time, I was a kid who was still drawing goofy things like space monsters." So decades later, when James received the call about the Nauvoo temple, he was overwhelmed with emotion. "I got off the phone and just bawled," he says. "Of the millions of people in the Church, I got to be one of the guys to do it. It was a real testimony builder for me: if you do what's right, sometimes good things happen. It was just another tender mercy from the Lord that I got to enjoy." 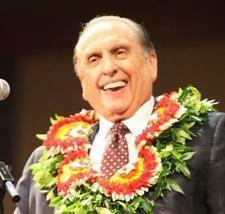 Throughout his career, James has made a point of describing himself not as a Mormon artist, but an artist who is Mormon. And although early on he thought he kept his art and faith separate, he now says, "Looking back, I can see that my faith seeped into everything." James decided long ago that he would choose his subjects carefully, avoiding confrontation and negativity. "I want my work to communicate values that are positive and uplifting, to encourage people to be happy and enjoy life. There is enough darkness in the world - I'm trying to build the kingdom with the gift that I've got." He adds, "As I've gotten older and become more well known, I've realized very much that I have a responsibility as a Church member." As James has tried to share inspirational messages in his own unique way, he has found great success in touching people from all walks of life. He recalls, "Years ago, I had a show, mostly fantasy, but there were messages in it. A man came up to me afterwards and said, 'You know something. There's something in this work. I don't know what it is, but it's good and I want to know about it.'" He continues, "I said, 'I do know something you don't know - I know what I have to do to be happy. I have a couple of friends I can put you in contact with.' And he agreed." Opportunities like this are not unusual for James, and it is often through two of his most common and beloved characters - the hunchback Everyman and the poofy guy - that he is best able to reach people. While they may seem to be just fantastical, quirky beings, their meanings run much deeper. "The hunchback is Everyman - male or female, adult or child," James says. "All of us have humps. We're all imperfect. Some of our humps show, some of them don't. It's the idea of the imperfect person trying to figure things out." In fact, James says that more than any other painting, he has received expressions of gratitude for his 1992 painting entitled Sometimes the Spirit Touches Us through Our Weaknesses. Similarly, the poofy guys represent human foibles and failings. Their many layers of fancy clothing make them almost spherical, restricting movement and progression. "The clothes of these poofy guys became a metaphor for human baggage, all the things that make us feel important," James says. Overcoming weaknesses or becoming humble so we can learn from our mistakes are not new concepts to Latter-day Saints, but they are often novel ideas to other people. In fact, sometimes what James originally views as a very LDS idea has amazing appeal with his general audience. "I'm always surprised when I throw in what I see as an LDS theme how many others find it a universal idea," he says. One of James's most obvious Mormon themes appeared in a 2007 painting entitled Hold to the Rod, the Iron Rod (above). In it, the character is burdened with dozens of objects he has collected to make himself feel confident and safe. "They may be material possessions, but they may also be titles or responsibilities," James adds. The man longs to reach up and hold the iron rod above him, but he is afraid to let go of his belongings. At first, James dismissed the painting as something viewers at large would not be interested in, but Scott Usher, James's publisher, convinced him otherwise. "The painting was in my studio because I was having a show. Scott, who is not LDS, asked, 'What's that?' I told him it was a Mormon thing and that it didn't have much relevance outside the LDS audience. He said, 'Yes, it does. We all have to make that decision. Whatever our iron rod is, we all have to decide what's important.' That image sold all over the country and was gone within a few days." With his uncanny ability to create not only worlds of whimsy and imagination, but also to reach beyond facades to touch the hearts of people everywhere, there is no doubt that the world is a more magical place with James Christensen in it. He consistently finds a way to lift the spirits of others with his art, whether that means simply entertaining them or teaching them with symbolism and deeper meaning. "Some of my art just tickles your imagination," James says with a twinkle in his eye. "I want to inspire people, but I inspire with imagination. Some of the goofy fun stuff gets somebody interested in my work, and sometimes they get to feel the Spirit later."